You dutifully click on the link and the DNS server directs you from the IP address say: 55.55.555.5555 (not a real IP, I hope) to http://www.howeinnovative.net. Signing up for our newsletter and hiring us immediately or something like that. In the case of a DDoS attack, the translation from IP to text address never happens. The DNS craps out and the IP can’t be loaded because the DNS servers can’t direct traffic to the correct IP. Cut to millions of Americans quietly weeping with no Twitter to troll, music to act as the soundrack of our lives or useless crap to buy using Prime. Plus many, many other fruitful, productive disputes disrupted. 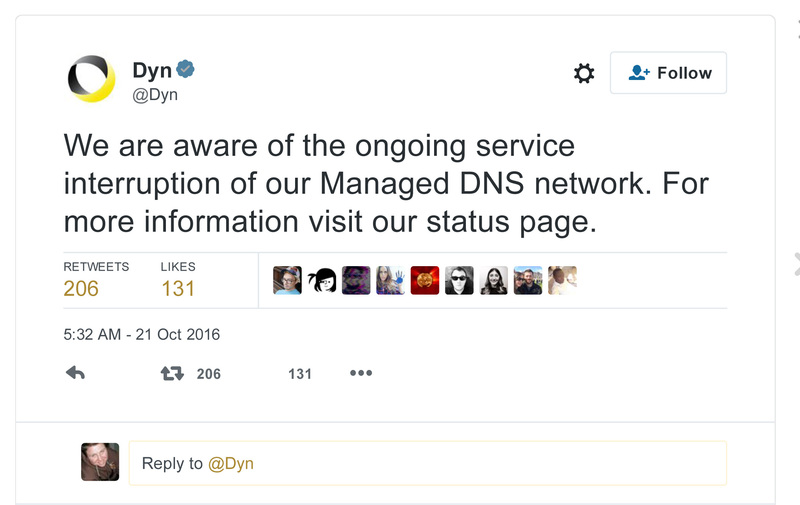 Dyn, the company whose servers are currently under a third wave of attacks as of 3pm MDT, is currently under seige. They are doing their best to fend off these attacks but it is happening. The first attack was at 9:20 am EST, AKA when I get out of bed. At Howe Innovative Design we use a West Coast DNS provider with solid services and great security. We try to source all services as close to local (either in Salt Lake City, Utah or in Portland, Oregon) was we can manage. In this case, it’s Southern California, dude. We will monitor the situation and keep you updated.